It may be that the great weather Israel enjoys most of the year is what makes street food so popular all over the country. The fact that you can walk outside and eat outdoors also fits the Israelis’ temperament, people who are known to be open and candid and not necessarily very polite. 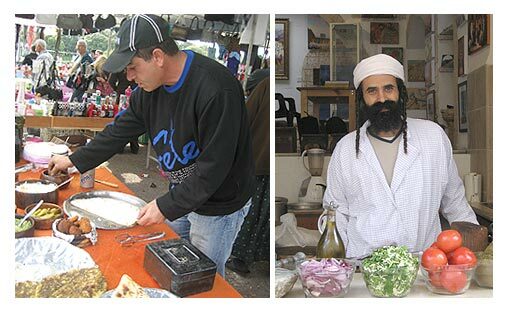 Be it as it may, during a culinary tour to Israel or a cooking vacations, you are bound to meet the people outside in markets and stands and experience the huge variety of street food around the country. The one street food that has developed into a real national dish is of course falafel, balls made of hummus and spices, fried in deep oil. Falafel is an Arab dish which was adopted in Israel in the late 1950s and later on underwent modifications and improvements which made it into a real Zionist street food. Falafel is usually served in a fresh pita with a variety of salads, tahina and pickles. 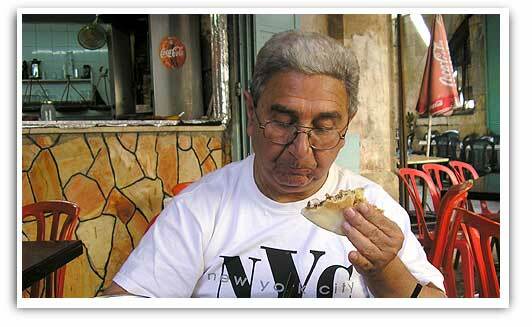 You can order a whole portion of falafel (a whole pita with about 6 balls) or half a portion (half a pita with 4 balls). In most places you can take as much of the salads offered as you like. A portion of falafel costs about 15NIS. Along Ibn Gvirol Street in Tel Aviv (which is lined with food stalls all along) you can find dozens of falafel stands. In Jerusalem, for example, we recommend trying “Between Gaza and Berlin” (55 Aza St, Jerusalem), where particularly fresh hummus is served as well as falafel balls, koubbe and additional home-made dishes, all excellent and extra-fresh. In the typically Israeli family of street-food, falafel is the eldest son, but the family has a daughter as well: shawarma. Cuts of meat (usually turkey, but originally shawarma was made of mutton) which are packed into a laffa (a large Iraqi pitta ,which one fills and rolls like a huge taco), with salads and potato chips. A portion of shawarma costs around 25NIS and you had better take into account that it’s a really large dish. Here too salads are served with no limitation. While on your cooking vacations, it’s a good idea to try out “Shawarma Daboush” at Ibn Gvirol St. on the corner of Zeitlin in Tel-Aviv. The line here is long at all hours of the day and the night, but this also ensures a very fresh product, prepared right there, along with a generous variety of bit spicy salads. 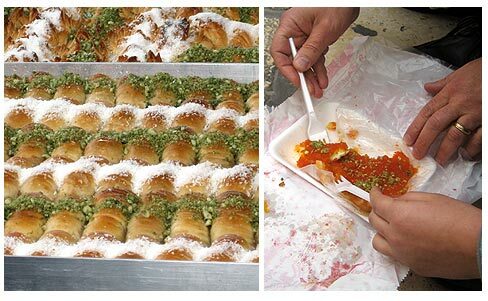 As part of the same family of street-food you can encounter Sabih. There’s an ongoing controversy regarding the origin of the name. Some claim it has to do with sabah, which is the Arabic word for “morning”. Yet others say it’s a Hebrew acronym for “salad, egg and more eggplant”. 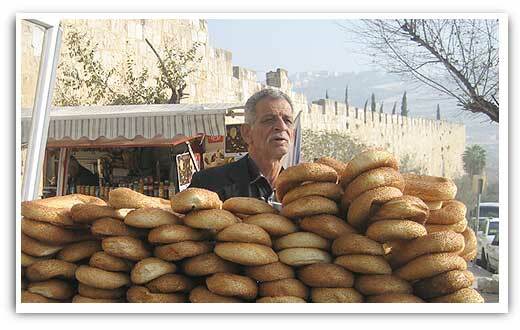 The most famous Sabih stand is probably “Oved’s Eatery” at 7 Sirkin St in Givatayim. Oved himself is a colorful character whose behavior is reminiscent of the famous Seinfeld character “The Soup Nazi”. Oved has his own language, a huge crowd of devoted customers. Here too you’re bound to encounter a long line, but it’s worth the waiting: the taste is unbeatable. The king of sweet street-food is without doubt ice-cream. Tel-Aviv is packed with ice-cream parlors of various kinds. Some of these have joined the health-food trend and offer yogurt ice-cream with a variety of toppings. Try “Yogo” on Rothschild Avenue in Tel-Aviv or maybe Italian cream-based ice-cream. For this, one of the oldest and most special ice-cream parlors is “Iceberg” (there are two branches in Tel-Aviv, on Ibn Gvirol and on Ben Yehuda). “Iceberg” offer a unique choice of flavors, such as pineapple-vodka sorbet, orange-chocolate, pepper and mint sorbet (no mistake here!) and many other creations. All the ice-cream is made right there using natural ingredients and limitless creativity, making sure the sweet side of your Cooking Vacations is taken care of.